League of Women Voters of Michigan president Judy Karandjeff (at podium, center left) speaks to a capacity crowd at East Lansing High School about re-districting. 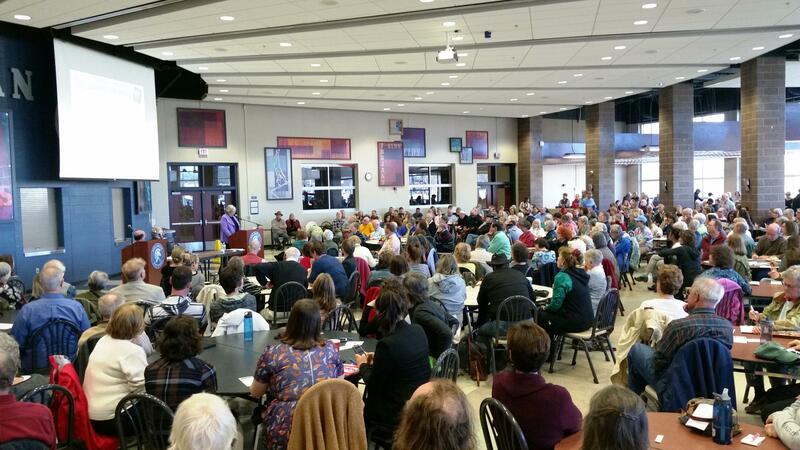 On a day when you couldn’t have blamed anyone for basking in a warm late winter sun, almost 600 people packed into the East Lansing High School cafeteria. For the event’s organizers, the capacity crowd was a welcome if not ironic sight. So many people had squeezed into the room for a public forum on gerrymandering -- the technique political parties use to compress as many of their base voters into a single district as they can. The event was co-sponsored by the Michigan Election Reform Alliance and the League of Women Voters of Michigan. Organizers noted that while the Republicans have held the majority in Michigan for nearly two decades, gerrymandering is a game played by both sides. Each state draws its own congressional and legislative districts after each federal census. In 26 states -- including Michigan -- that’s the job of the legislature. The rest create their boundaries through commissions. Some advise the legislature; others are made of political appointees. In a small handful of states, a backup commission takes over if the legislature fails to draw a plan. Five states rely on independent commissions, including the one with the most political districts. Under then-governor Arnold Schwarzenegger, California enacted the nation’s most comprehensive redistricting reform policy. And in 2015, the U-S Supreme Court upheld the constitutionality of Arizona’s re-drawn map -- also drafted by an independent commission. Some who attended the East Lansing forum had their own ideas about how Michigan might level its own political playing field. Pat McConeghy of DeWitt believes an apportionment system might be the answer. Abby Schwartz lives in Lansing -- a city that straddles three congressional districts. She favors something called a “splitline algorithm,” a mathematical process that draws the shortest possible lines to split Michigan into equal population centers. 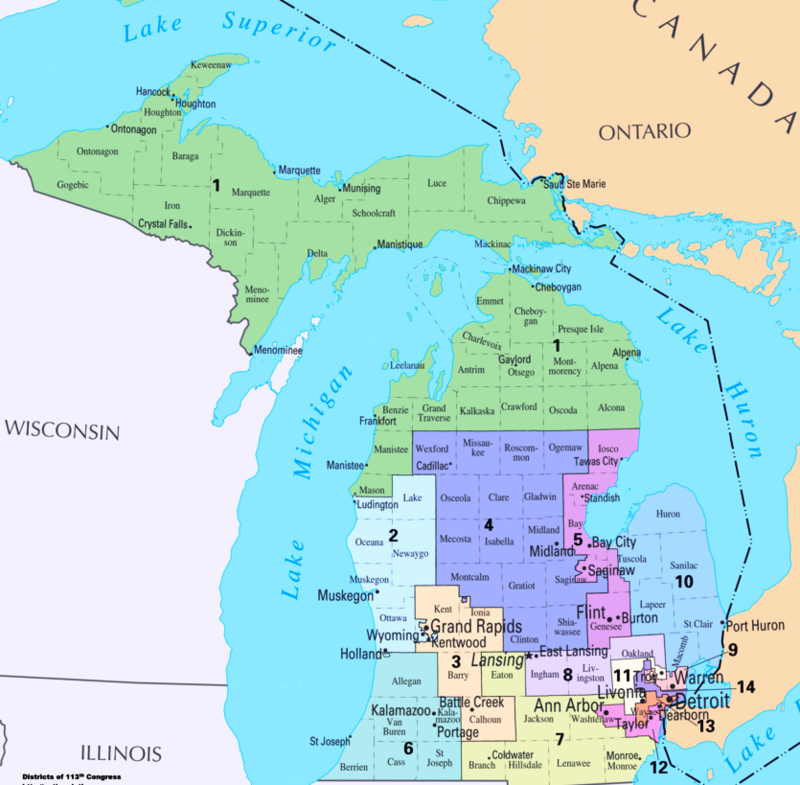 There may soon be some legal action in Michigan aimed at breaking district gerrymandering. Last November, a federal three-judge panel struck down the Wisconsin legislature’s political map, calling it overtly partisan. That case has emboldened Michigan Democrats who believe they too might mount a similar legal challenge. Former party chair Mark Brewer is representing plaintiffs in the case, but has not yet formally filed suit.